I was hired as a permanent employee with the U.S. Fish and Wildlife Service (FWS) Exploratory Fishing and Gear Research Base (EFGRB) – and reported for work on July 5, 1960. I was excited and anxious to see the R/V John N. Cobb. While waiting in the hall on the second floor of the Montlake Lab’s EFGRB office I met Al Pruter, who was also standing there to get fingerprinted as a new hire. Al was another WW II veteran and had met Lee Alverson at the College of Fisheries where they had been classmates. Lee had attracted Al from the Halibut Commission to be his deputy director in 1958. Al would become the most important mentor in my career, the quiet steady one. that Al was his classmate at the College of Fisheries, was an “A” student and if he didn’t graduate Phi Beta Kappa he should have. He was the smartest individual Jergen knew. He was also an excellent administrator and he and Lee made a wonderful team. Lee was good with groups while Al was better with individuals and was outstanding in writing and planning. Al took me down to the Cobb about a week later to inspect it and in the middle of August I was assigned a trip with him. It was the second half of an exploratory bottom fish cruise (Cr. # 47) to Queen Charlotte Sound, B.C. Canada, one of the main fishing grounds for the US trawl fleet during that time. Reported areas off Cape Scot had been reported untrawlable, so our job was to discover possible towing areas within them and which commercial species were present. On the trip north we had a number of bathythermograph or XBT casts to take to determine the surface water contours with depth along the outside of Vancouver Island. That’s why we didn’t take the inside passage on the east side of Vancouver Island, which would have been much more comfortable. I should have had a clue of what was coming when the cook replaced the tablecloth on the galley table with a rubber mat and installed a railing around the top outer edge of the table, which was designed to keep dishes on it and not in our laps when we got offshore. The first job I had was to make XBT casts. An XBT is a long tube with fins on the end which is lowered from a cable down the side of the ship. Before it is deployed a coated glass slide is placed inside and as the unit descends, a needle traces the temperature vs. depth onto the slide. 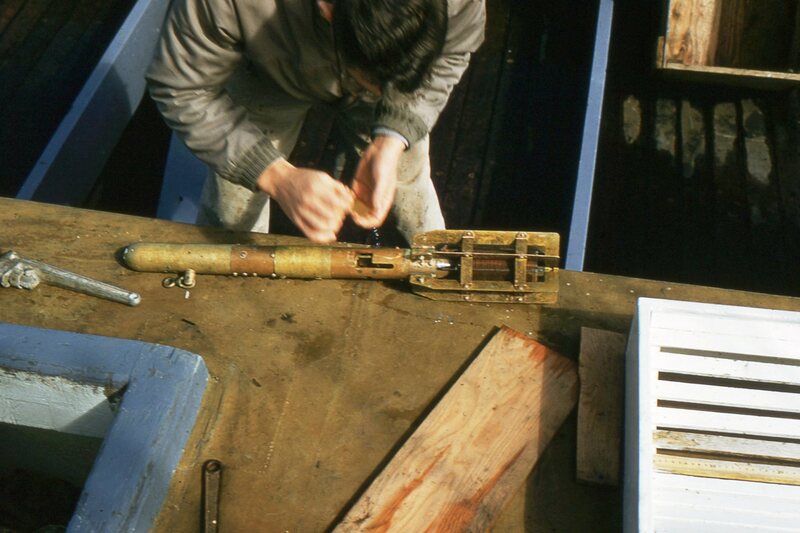 After the XBT is retrieved, the slide is removed and stored in a box. It was at night and we were offshore and I was seasick, so when I went out on deck to hook up the XBT, Al followed me to make sure that I was stable enough not to fall overboard while launching and retrieving it. I had to load the slide into the XBT and attach it to the cable. The skipper or mate started the winch overhead, taking up the slack as I put it over the side into the water and letting it down to the desired depth. Hauling it back up and stopping it just below surface, I took a pole with a wire loop on its end and caught the cable so that when the XBT broke the surface it was kept from banging against the side of the rolling vessel. Once above the surface I would bring it aboard, disconnect the cable, place the XBT in the rack and retrieve the slide. I didn’t fall overboard and I accomplished my first task at sea. 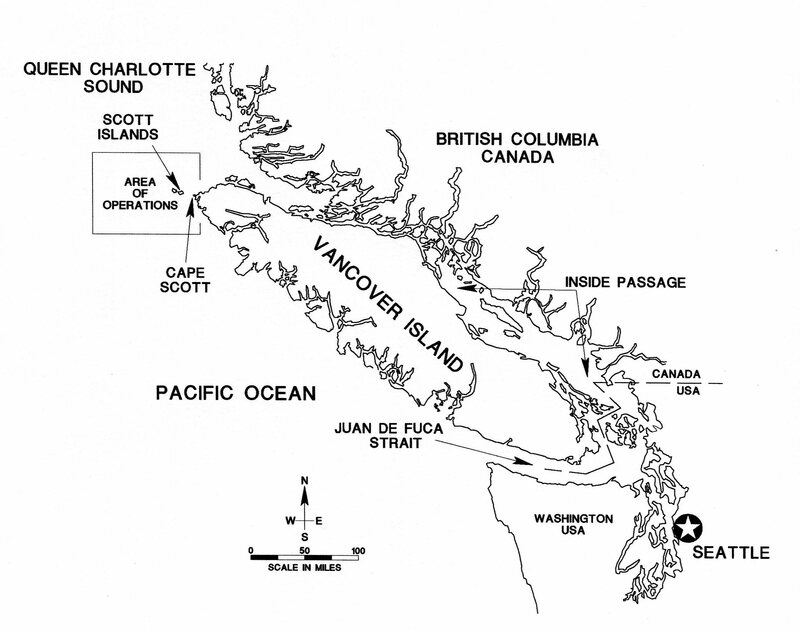 The next morning the boat kept running northwest as we stopped periodically to make XBT casts along Vancouver Island. I went to breakfast, but because of the ocean swells I wasn’t feeling too good and hung back. There was a seat on the outside corner of the table closest to the galley door so I sat down there to eat, keeping my meal down but not feeling great. Still fighting seasickness I went outside by the portside door and leaned against the after side of the house and looked at the horizon, trying to forget the smell of toast and the taste of chalky milk. It was years before that image was gone from my mind. 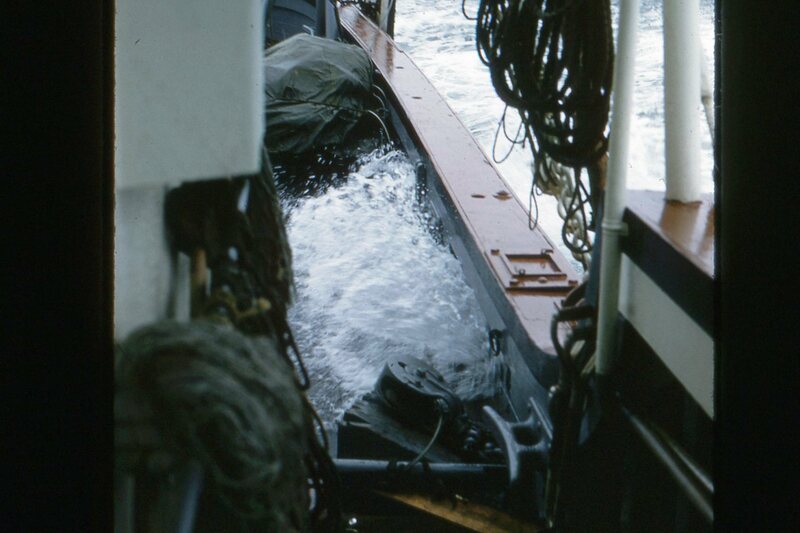 Later a crewman told me that I had sat in the skipper’s place. It was the closest to the bridge and in case of an emergency he could respond quickly. Not a good start for my career. 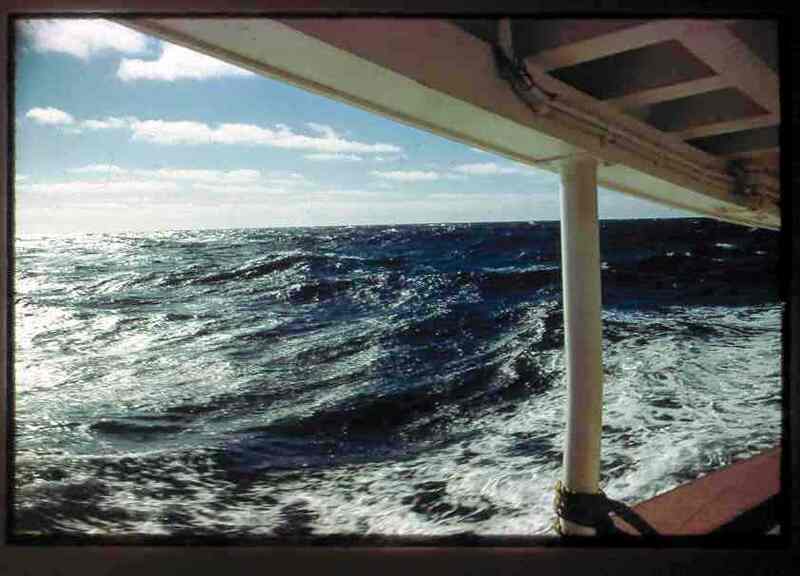 The after deck was wet as the seawater came in through the scuppers as the vessel proceeded through swells and chop toward Scott Island. I was at sea, aboard the John N. Cobb for the first time, and the statement that I heard at the office was going through my mind: “Go to sea and publish and you will be rewarded,” which was important because I had decided not to continue my education. I’d reached an impasse – getting through the foreign language. I had taken the test a number of times, but just couldn’t pass French. Even if seasickness was a problem for me it wasn’t as bad as taking that test again for the master’s degree. My education had already proved its worth – I was employed and aboard the John N. Cobb. 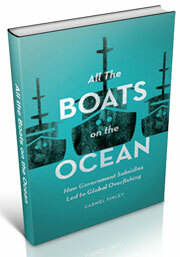 It was a thrill to be part of this crew, eight fisherman and two scientists, myself and Al. The vessel was a tool used by the scientific staff and the ship’s crew was made up of commercial fishermen and headed by the Captain, who had the responsibility for operating the vessel safely. The scientific staff was responsible for conducting the scientific part of the cruise and it rotated between cruises. Those trips were 3 to 4 weeks long and the scientists had two to three trips a year. The chief scientists and the skipper worked together and the Base Director issued Project Instructions to both of them. This document gave the itinerary, when and where the vessel would leave and return to its home port, the area of operation, the Objectives, the Methods, the Records to be kept, and the scientific personnel assigned to the trip. 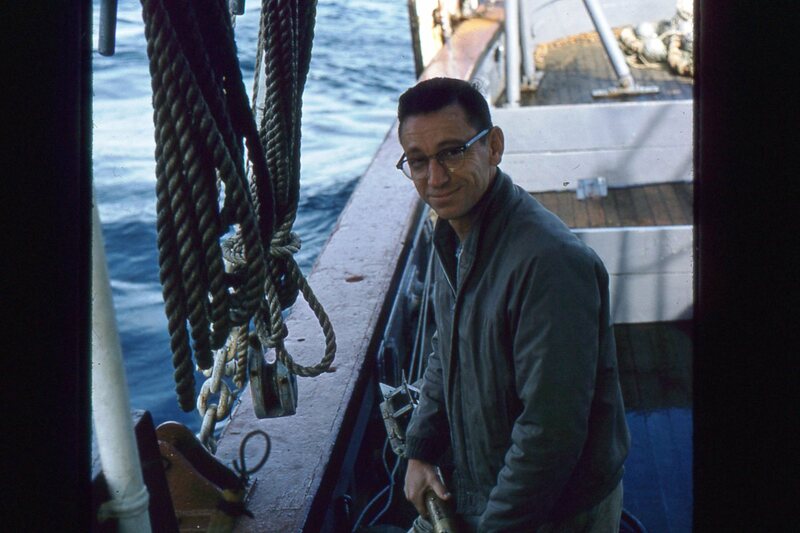 I was assigned to the trip from August 15 to September 9, 1960 as part of the scientific team, myself and Chief Scientist Al Pruter. The Cobb arrived on the grounds where they’d left off during the first part of the cruise (1) August 17, 1960. At the end of the first part a successful tow, # 44, had been made but the net malfunctioned, the catch was lost and they wanted to repeat the tow to determine what was there. So haul # 45 was made for one hour at a depth of 83 to 88 fathoms. The estimated catch for this haul was 2,000 lbs. and the catch was brought aboard in one lift and sorted by species. The rockfish were divided into three groups: there were 700 pounds of red, 70 pounds of black and 140 pounds of flagged, whereas the rest of the fish catch was easily sorted into individual species. What species were the rockfish? Out came the fish keys, namely Philips (2) and Clemens and Wilby (3). We found that the red ones consisted of 200 lbs. of canary (S. pinniger), 500 lbs. of Pacific Ocean perch (S. alutus) and one bocacco (S. paucispinis), while the other two categories consisted of one species each, the silvergray rockfish (S. brevispinis) and the flag rockfish (S. rubrivincutus). 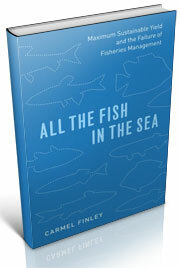 So little was known about the rockfish at the time – I was on my way to an exciting career. R. Hitz, H.C. Johnson, A.T. Pruter (1961). 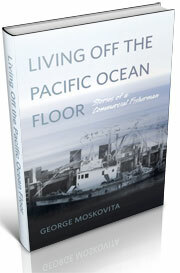 Bottom Trawling Explorations off the Washington and British Columbia Coasts, May-August 1960. Commercial Fisheries Review, June 1961, Vol. 23, No. 6, also U.S. Department of the Interior, Fish and Wildlife Service Sept. No. 620. Phillips, J. B. (1957). A Review of the Rockfishes of California. California Fish and Game, Bulletin No. 104, 158 p.
Clemens, W.A. and Wilby G.V, (1961). Fishes of the Pacific Coast of Canada. Fisheries Research Board of Canada, Bulletin No. 68, 443 p.
This entry was posted in Cold War, Dayton Lee Alverson, Environmental History, Exploratory Fishing Base, fisheries science, Fishing, History of Science, History of Technology, Maritime History, Ocean fishing, Pacific Fishing History Project, R/V John N. Cobb, Resources About Fishing, Rosefish, Sebastes rockfish and tagged bathythermograph, groundfish, Pacific Ocean Perch, trawling. Bookmark the permalink.